Does fashion precede freedom for some women? We’re seeing freedom (and fashion) statements — from the nailpolish worn by individual women in some of the photos of the revolt in Tehran to designer handbags on display — also partial face masking plus improperly worn head scarves, a punishable offense against women by the men who run political Islam. Images from Tehran suggest that forward progress of women’s global liberation may include steps through stages of self-actualization within the framework of what global culture currently supplies. For women living under a religio-politico system of subordination by dress code (and chronic behind-closed-doors violence nobody witnesses), any woman in public improperly wearing her male-required head scarf provides a brave act of defiance in our world of cell-phone cameras and Twitter. Some of the women pictured can afford Twitpic, they may Twitter. They could probably afford (or somebody in their family afforded it for them) an education. They can afford nail polish and designer bags. 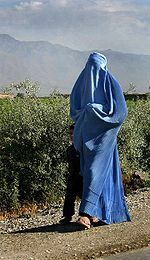 When they revolt against the male-imposed veil, they revolt for women around the world who are required to comply by economic deprivation, threat and actual violence with their second-class gender caste status. 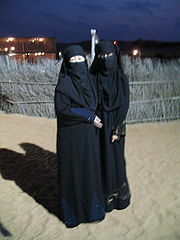 In the facade for misogyny political Islam provides, it cannot advance anybody’s liberation to see a woman wearing political Islam’s required headdress — admittedly by the religion itself a symbol of male subordination of what men have dubbed as an “impure” womanhood redeemed through being masked in public. That said, perhaps we outside Iran should consider whether we want to support women’s right to be free from religion, when every woman in question not only has no independent voice in the public sphere but we also cannot so much as see her face. Maybe in some way of progression I do not fully understand as a guy with global male privilege — maybe when teens outside political Islam “sext” their boyfriends with technology, when a woman in Tehran streaks her hair and improperly wears the head scarf in public, when women try to own the agency as actors of being “hot” — it advances women’s global liberation. Maybe any fashion chosen by a woman — even if the available manufactured options tend still to objectify women as women, as a gender class — is still a little closer really to being free. Maybe it’s all steps of progress. All necessary as part of the process of woman and women getting out of the male-dominance of being male-objectified targets in the longest war.